The frames were transferred to my hive last Saturday, 31st July 2010. I didn’t manage to spot the queen but all did look queenright. On Sunday 1st I added syrup as I had been advised just before dusk, closed down the opening to about an inch, and left them to it. On Tuesday 3rd they did not seem to have used any syrup so I dripped some through to the frames from the reservoir. It seemed to give them the idea. I didn’t open the hive again until 6th August. The weather during most of the week was fine. Lots of pollen seems to being brought to the hive mainly a pale mustard. I’ll work out how to post some pictures. 6th August; weather much cooler and so the sugar syrup suddenly has been used and needs to be topped up. It has almost vanished again by my inspection on the 7th August. 7th August. Counted 8 frames of brood. There was also a small section of a frame that looked like a swelling of sugar syrup or honey. It was not a queen cup though near it was something that could be the start of a queen cup, I squashed that. Sealed brood, but also brood of various stages sealed and unsealed. Didn’t spot very fresh eggs but the weather (lack of brightness not helping visibility) and also the fact it was not as warm and I needed to work quite quickly meant that I hadn’t time to peer. It also looked as though some of the older capped brood had hatched. there did seem to be a healthy number of bees on the whole. 6th August. It has been a much duller day to-day. The bees have again used sugar syrup though they have been foraging well when it has been drier and warmer for short periods. I feel a real heel today. yesterday I placed the apiguard in place. the man from whom I got the bees and to whom I returned the brood box, screen etc yesterday, said he doesn’t use it now. He says it smells dreadful to use when the hive is opened so how does it smell to the bees when they are cooped up with it in the hive? But it seems the easiest way for a beginner. You place the opened circle with teh gel inside on top of the frames. Add an eke ( a very shallow frame to make sure there is sufficient room for the bees to get at the gel) and then put teh hive parts back together. I have also put in a floor so I can count and see if there is any mite drop so that will make the smell even worse with less fresh air coming in from the bottom. i wonder if I placed the floor half in and half out – at least during teh day whilst it is dry. I should still be able to see some mite drop if there is any and they will get some fresh air. The bees must have a good sense of smell as they need it to locate pollen and also they pass on smells for information between each other. I believe they know which is their hive and also the smell is used to alert them as to whether their Queen is in the hive and laying well. The more I write here the more evil I feel. I should be nurturing them so they can build up stocks and settle in. My HW mentor says they have seen varroa getting active in the High Wycombe area so I must be strong. In the long run helping them avoid the problem of varroa infection is most important. My other contact is in Milton Keynes and obviously has many hives and has not seen varroa yet this end of the season. My bees, from his stock, may be in a similar lucky position. I left the apiguard in for just over a week. The queen had stopped laying and the bees had stopped feeding on the syrup. I thought this would jeopardise their surviving the winter in another way. I instinctively felt all was not well with them and I examined the solid floor inserted below the mesh very carefully and saw no mites at all. Possibly one or two – but when I say possibly, these were really not what Paul had shown me and only a very very slim chance that they could be the dreaded mite. I was so glad he had been able to show me one as it made me more confident about my ‘diagnosis’. All of this reminded me about my degree and the statistics of type 1 and type 2 errors. I can never remember which is which, but basically if you are dealing in a medical context and testing to see whether a disease is present and whether to treat there are two main errors. One is that you deduce there is a disease when there is not and the other that you deduce there is no disease when in fact there is. I find weighing up these seems to allow me to make many life decisions! It also helps me come to terms with these horrid steroids – I can see the Dr made the decision that the risk of assuming there was no problem when in fact there was would lead to a high chance of blindness so erring on the side of treating me given there were some indications of the disease made sense even though the treatment has side effects. I have enough evidence indicating no varroa to risk not treating – or at least not treating any more yet! Around me fellow beeks are not quite treating – they are waiting for the supers to come off and talking about treating in September as we are in the south and can expect suitable temperatures. If all beeks treat at a similar time the herd treatment can benefit the whole area. The whole varroa issue and how I treat my bees as a result has been going round and round in my head. I have ordered a magnifying glass; this will help me confirm that there is no evidence of varroa with more certainty. I have also ordered a different treatment having spent ages looking at all the options. It can be used to identify whether there is a varroa problem of such proportions that more severe action needs to be taken. I feel fairly comfortable this is the right decision. I’ve also ordered a larger feeder as it seems silly to disturb them almost every night to top up the smaller feeder. On inspection on 22nd august, I can again see larvae but not as plentiful as before. 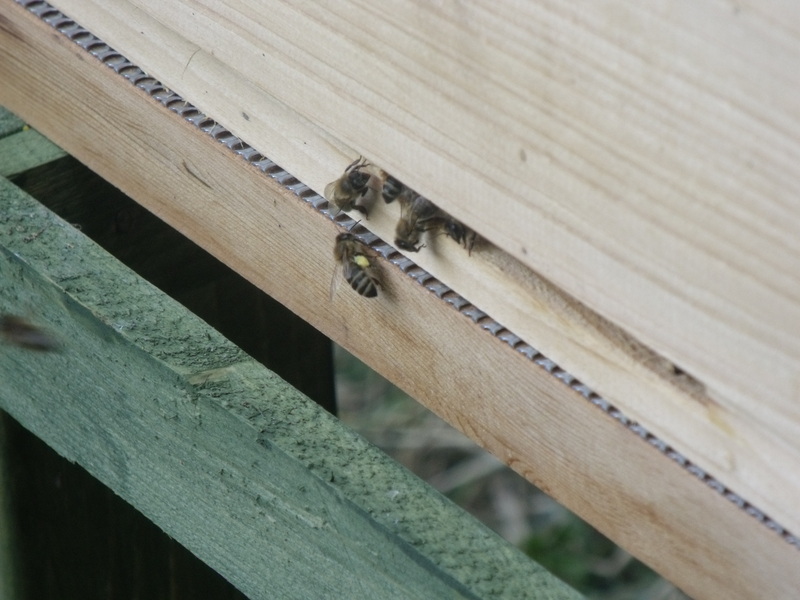 There seems to be lots more honey supplies in the frames, some pollen stored and coming in. It is almost that they have used the cells for honey so there is less room for any eggs. There is capped brood still – I only spotted one drone cell capped. When I had the solid floor in place for the varroa treatment I was intrigued to see that the grey pollen (bramble) that had fallen through was all in one place. I wonder whether they store similar pollen in special places? It makes me think of the way my OH sorts the bottles in the cellar – here the red, here the white …. I have also cleared the apiary a little. Hope it does not disorientate the colony! It has been a rainy few days. I had left the wheelbarrow by one of the hives and eventually tipped the rainwater out when it had almost filled the thing! I have been filling the smallish syrup feeder; I guess with a total of about 8 pints by now – I probably should have made a note in the hive record. I have created an Excel spreadsheet as a hive record. I have allowed for expansion by colour coding rows and thought I had all the suitable columns but recording volume and strength of feed is probably wise. Soon I think I shall add a colour coded shape by the entrance in addition to the coloured tile on the roof. I read somewhere that the bees can determine shapes as well as some colours – sounds like Playschool – is it the round doorway or the square? If I print and then laminate I think it will be quite durable. To-day is warmer and either to-day or to-morrow I am going to replace the small feeder with a larger one. My OH has added holes to a crownboard which already had two porter bee shaped holes in it. There are two feeder cones in the new miller style feeder. I know there have been one or two casualties in the syrup. I try to fill it up with syrup very slowly so the bees have time to realise and retreat. With the larger feeder the level of syrup will advance more slowly and the ribbed entrance cones and covers should also help the bees avoid being drowned in syrup. At some stage I understand the drones will be pushed out of the hive as they will not merit the precious reserves of the colony. I noticed just one drone cell at my last inspection. Presumably, though the drones do not deserve to be supported over winter, the colony understands that if a new queen is required at any stage then the presence of drones is required to mate with the queen. The drone cell was capped so will hatch in a couple of weeks at the most. Will it be allowed to overwinter? 30th August. Have they discovered the hebe? The lacecap hydrangea has been consistently used by the bees for pollen and it seemed odd the nearby hebe had been ignored. 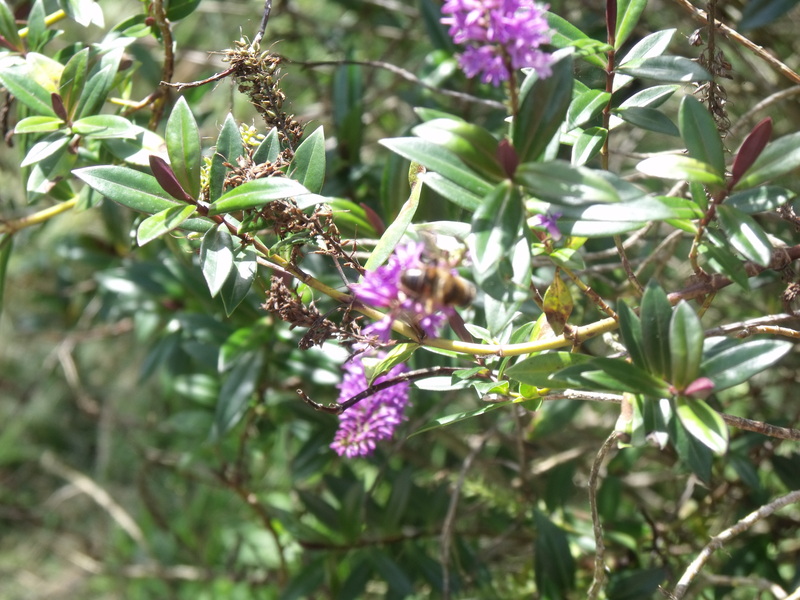 Today I saw, as well as 2 sorts of bumble bee on it, some honey bees. Of course they were camera shy and tried to hide round the back of the spokes when I tried to take a photo. However, two of the pictures are clear enough – on one the bee is in flight near by. I wonder whether they’ll do a waggle dance and there will be more bees on the plant to-morrow? 1st september; the start of the new year as far as most BKA subscriptions are concerned. 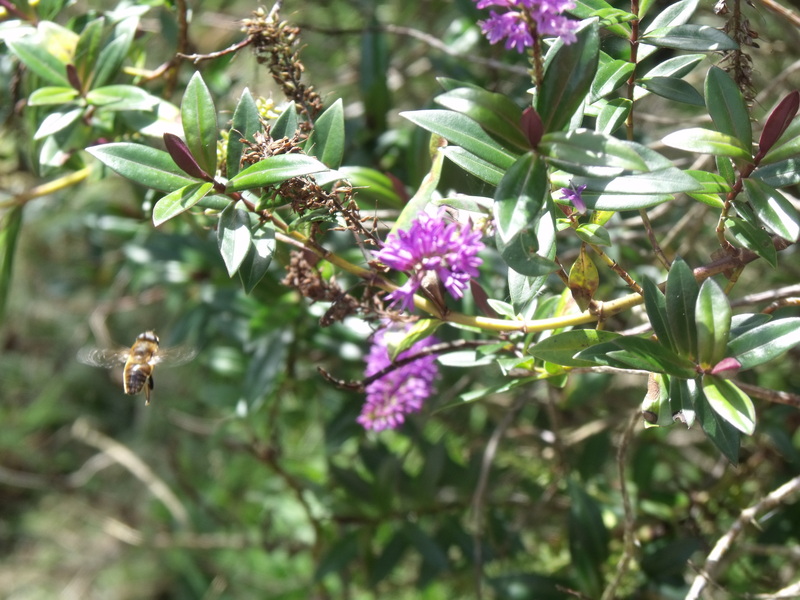 The hebe is hosting several of my bees but also bumble bees (the red tipped as well as the normal stripy ones) and some things which could be bees or could be a sort of fly. They look as though they have one stripe down their backs along its length rather than across from side to side like my honey bees. I couldn’t spot the colour of any honey baskets so I might try and have another look later. I also need to decide what to do re varroa. I have seen absolutely no evidence of any and I am inclined to give an icing sugar treatment. I have had the board in place to check over the last few days. I would also like to know whether pollen falling through to the ground is likely to encourage wasps at all. It is certainly warm enough to open the hive, but will I have time before I teach? 2nd September. I have seen my queen, I have seen my queen. With Paul’s persistence and help, I hasten to acknowledge. Really helpful to have someone with more knowledge than I to have a look and confirm some things, point out others. Paul is so tactful, as well, makes constructive suggestions (eg putting back the frames differently, using the self spacing mechanism to place the frame more closely to where it should be and then there is less chance of squashing) but doesn’t make you feel a novice. paul also had a look at the board I had kept and confirmed that the only bits that could be mites were not. I had thought they were not but was worried I may not know enough so could be wrong. Paul’s verdict was that the colony seemed quite good so I feel that much of my instinct has been spot on.